Tenzing-Hillary Lukla Airport,World highest The airport of World located at the highest altitude lies at Syangboche. Tengboche Monastery the Buddhist lighthouse of Everest region. Everest view hotel which is the highest elevated star hotel in the world. the chance to see sherpa people,yak and It is where four of the world's six tallest peaks including Lhotse, Makalu, Cho Oyu and, of course, the Everest and many more mountain peaks. 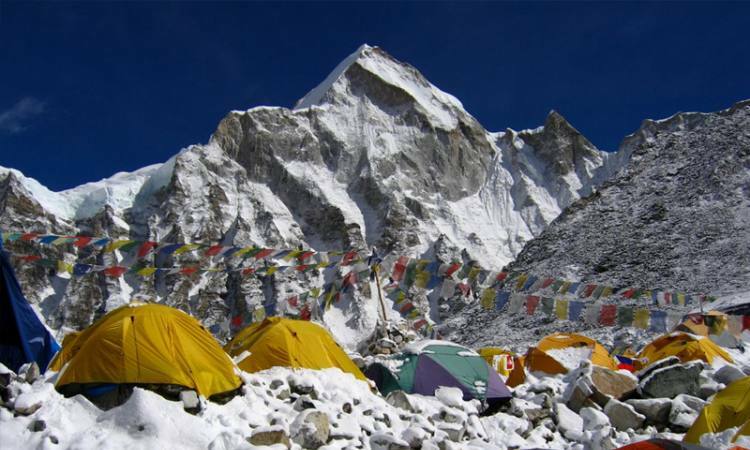 The highest peak on earth, The Mount Everest smiles on the every walk of the Everest Base Camp Trekking. This trekking is considered as the trekking with adrenaline rush and strenuous however the marvelous view of Everest and its surrounding let you forget all the tiresome. Backpacker Treks understands the human value and the time of people as precious as the golden chest. Therefore, we have designed the shortest route to the view of Everest up close via the Everest Mini Trek concept. Those trekkers who are willing to take the experience of Everest and its surrounding mountains terrain within 10 days of their time while doing vacation in Nepal can choose this package of ours which would be of worthwhile of every penny spent on the tour. The journey starts from the airplane carrying you to the most adventurous airport on earth, The Lukla giving you the chance to get an encounter with the boundless Himalayan ranges view and hilly terrain of Nepal from the plane. The joyous landing in Lukla would remind you of the great rocky terrain of Nepal. Though Lukla airport is regarded as the most dangerous airport in the world, the fun and safety are guaranteed for our guests. The fear of unknown could vanish with the view of majestic Mother Nature on the way to Lukla. The actual walking trail starts from Lukla which is also the gateway to the superlative mountain called Mount Everest. The first day of trek would of the honeymoon for the trekkers as we have designed to acclimatize all the trekkers as quickly as possible. The continuous downhill trek to Phakding let you relish the jaw-dropping scenery and the alpine forest. The Phakding offers you the good day rest with the amazing hospitality of the local hotel operated by Backpacker itself. As is our motto that the trekkers should be given the chance to experience the authentic taste of the host place, we have operated ourselves an accommodation for your comfort. The next stop for all the Trekkers would be the Everest View Hotel which is the hotel located at the highest altitude in the world. The view that you get from there would let you forget all the pain, hard work and struggle that you do your everyday chores. The lens of the camera will not get any rest as the beauty around you continues to hypnotize you. The Everest Mini Trek takes you up close to the Everest and also let you have inner peace by letting you visit the famous monasteries of Tangbuche. The journey which started in Kathmandu the nerve center of Nepal would lead you to the lap of Himalayas and again let you enjoy the clamor as well as the charisma of Thamel in Kathmandu. The farewell night resembling the Nepalese culture and hospitality will bid farewell to you. Backpacker Team would like to assure you that the Trek name could be Mini but the experience that you gain in this trekking would be very important in the phase of your life which you will be boasting about generations to come. Day 01Arrive in Kathmandu & transfer to hotelUpon arrival at Kathmandu, Backpacker Expedition Treks Pvt. Ltd will be your trustworthy travel companion until you depart for your home country. We will accommodate our valued customers in the three-star hotel in Kathmandu. We take care of the room and breakfast of our valued customers during their stay in Kathmandu Valley. Day 03Trek to Namche Bazaar O/N Lodge Namche is a village and Village Development Committee (Namche) in Solukhumbu District in the Sagarmatha Zone of north-eastern Nepal. It is located within the Khumbu area at 3,440 metres (11,286 ft) at its low point, populating the sides of a hill. Namche is the main trading center and tourist hub for the Khumbu region with many Nepalese officials, a police check, post and a bank. It is also the place for acclimatizing for the trekkers to go further towards base camp. Day 04Rest day at Namche for acclimatization The acclimatization process takes place in Namchebazar by taking short day hiking or relaxing by roaming around in the Namche itself. According to health experts, the trekkers should always move while relaxing and acclimatizing to the altitude. So, we take our fellow trekkers to either short hiking or walking in and around Namche before setting up for the further trek. Trekkers can hike to the world’s highest placed hotel “The Everest View hotel” from where you can see the spectacular view of the Mount Everest, Ama Dablam, Thamserku, Khangtega and other panoramic views of snow capped mountains. The Khangtega mountain is unique to its geographical setting as it resembles the back pack of Horse riding. Day 05Trek to Tengboche & explore O/N Lodge After getting acclimatized we set off to Tyangbouche early morning after breakfast. The trail towards Tyangbouche is less smooth but it contemplates the trekkers with the majestic views of Mount Everest up close along with Mount Ama Dablam. The ups and downs in the trail gives our soul and body the ultimate challenge. The serene smell of pine forests and swift white river besides the trail makes the trekking tiredness to vanish. We will have the lunch on the way. Day 06Trek Back to Phakding O/N LodgeFrom Tengboche, a steep descent of about 1500ft/500m leads through rhododendron forests and fir trees to the Dudh Koshi River. We cross the Dudhkoshi river and we pass the village of Tashinga and Sansa before finally reaching beautiful village of Namche. Upon arrival at this juncture, we can have the gorgeous Ama-dablam, Thamserku, Nuptse, Lhotse and Everest once again. Day 07Trek to Lukla O/N Lodge The last day of trekking. At this juncture we will have fun while trekking with some songs on popular nepali folk tunes, we will share the pictures that we took and the memories that we cherished. Upon reaching Lukla we will give rest to our mind and body. Day 08Fly from Lukla to Kathmandu O/N Hotel We head back to Kathmandu and as earlier the accommodation will be provided along with the breakfast in a three-star hotel in Kathmandu. On a spare day, you can roam around Thamel or other major touristic areas at Kathmandu and do some shopping and dinner at Nepali typical Resturant with cultural program. Day 09Departure to final Destination (Farewell) We always feel very sad at this very juncture that our companion of trekking for the moment ends here and in the meantime we also feel relaxed that we were able to serve you with the best trekking experience that you ever get in your lifetime while trekking. We would leave no stone unturned to make your customers feel important and happy. We always take suggestions and encourage our valued customers to promote Nepal and Trekking in Nepal.